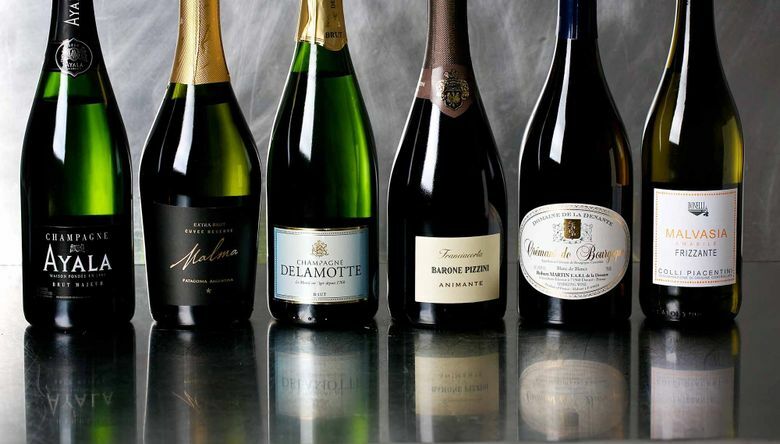 Shopping for bubbly for your New Year’s Eve celebration? Here are some recommendations. My final recommendations for 2017 include two superb Champagnes, a vibrant Franciacorta from Italy, a rich, sophisticated bubbly from Burgundy and a sparkler from Patagonia that just may turn your palate upside down. And for a holiday bonus: Let’s add a fizzy sweet malvasia from Italy for your holiday brunch. When first poured and cold, this wine was crisp and mineral, bracing and refreshing. As it warmed it became exotic, with the flavors of candied ginger, cardamom and cloves. Alcohol by volume: 12 percent. Franciacorta is made in the Champagne method, with the second (bubbles-producing) fermentation in the bottle. But this is brighter and fruitier than Champagne. ABV: 12 percent. Made by the producers of Salon, arguably the rarest, most sought-after Champagne, Delamotte is more like Champagne as we know it, and it is top-notch. It is on the richer side, with some toasty brioche flavors and a hint of ginger spice. ABV: 12 percent. Elegant, with serious aspirations — plus depth, complexity and character. ABV: 12 percent. This vibrant blend of pinot noir and chardonnay is electric with bright flavors of orchard fruit and berries. ABV: 12.5 percent. This slightly spritzy wine will appeal to anyone with a sweet tooth. Flowery and tropical, it is delicious on its own or with spicy foods or cured meats. Ideal for a holiday brunch. ABV: 8.5 percent.